Federal regulators today voted to approve the “Volcker Rule,” aimed at limiting risk-taking by big Wall Street banks. Under discussion for nearly five years, the rule (named for former Federal Reserve Chairman Paul Volcker, who proposed it), the rule is a prime example of the sort of tighter regulation that many — but by no means all — Americans support. A previously released Pew Research Center survey in September found that about half (49%) of Americans say the government hasn’t gone far enough in regulating markets and financial institutions. But 43% said government regulations have gone too far, making it harder for the economy to grow. 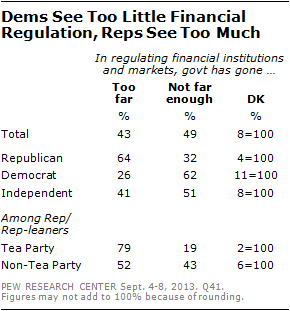 As with so many other issues, views of financial regulation are sharply split along party lines, the Pew Research survey found. 64% of Republicans said regulations had gone too far, versus 32% who said they hadn’t gone far enough; Democrats were almost exactly the opposite, with 62% saying regulations hadn’t gone far enough and 26% saying they’d gone too far. In its essence, the Volcker Rule bars banks from trading for their own gain and limits their ability to invest in hedge funds. But as regulators grappled with the complexities of modern banking, and banks fought back against what they saw as unwarranted restrictions on their activities, that seemingly simple rule grew and grew: The final version runs 71 pages, plus nearly 900 pages of interpretation.